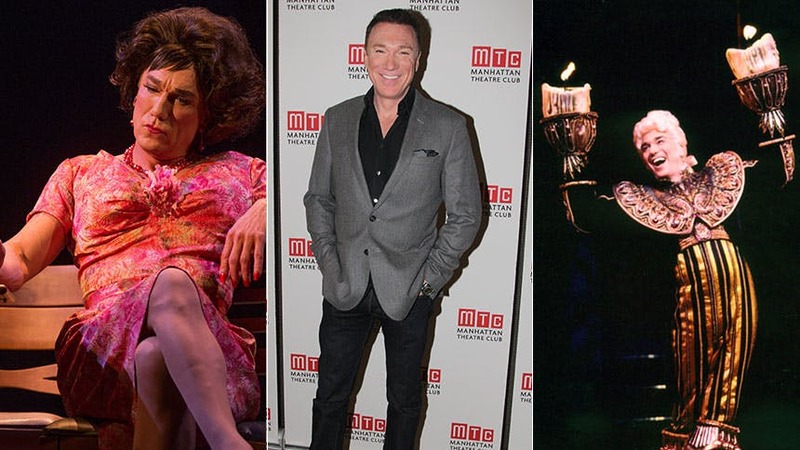 Patrick Page is giving an undeniable star performance as George/ Valentina, a crossing-dressing man who risks losing his Catskill retreat, in Harvey Fierstein’s world-premiere play Casa Valentina. To go into everything Page and the character go through would spoil it (and take a while), so just get your ticket and let this moving, magical new work rock your world. It’s been quite a Broadway season for Page, who gave one of our favorite villain performances this fall as the hateful southern lawyer Rufus Buckley in the drama A Time To Kill. Page is a Broadway mainstay, often playing the perfect antagonist in works like Spider-Man, The Lion King, Julius Caesar, A Man for All Seasons and Cyrano de Bergerac. A celebrated Shakespeare performer, Page has played all the Bard’s best roles in regional theatres throughout the country. Yet for this Casa Valentina star, it’s the colorful role that took him from classical theatre to musical theatre that he considers the real game-changer. Below, Page recalls how a failed Angels in America audition and an afternoon with Disney changed the course of his career. To preface, I think [Casa Valentina] is because it allows me to do something that's quite different in terms of the work I’ve done in New York, but in terms of the game changer for me that altered the course of my career: I was fairy new to New York, and I had mainly performed classic plays in regional theaters—this was 20 years ago—and I was auditioning for the first national tour of Angels in America. And I was right in the middle between Prior and Lewis—I wasn't really right for either of them but I was reading both, and I didn't get either. And he said, “the first national tour of Disney’s Beauty and the Beast." So I did the final audition, and in the room it felt really right—and I really didn't want the part. And indeed, I came home and I took a nap, and, by the end of the nap, I got a call offering me the part. And that's how I started what is now a 20-year association with Disney. I’ve done Beauty and the Beast, The Lion King and I’m about to do The Hunchback of Notre Dame; its been one of the most wonderful collaborations of my career. On that tour, I met my wife Paige Davis, who was in the ensemble and then later played Babette. Now, musicals are part of my career, but at the time it was never something I thought I might do. In every way, that moment Jay Binder said, “would you switch parts” was the game changer for me.